In an outing less successful than Bambi’s spin across the ice with Thumper, a deer found itself in dire straits after roaming out onto a frozen lake. 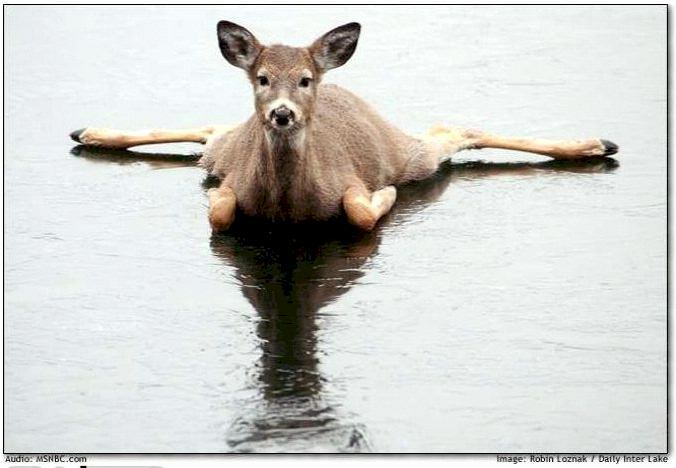 The ice wasn’t thick enough to support the woodland leaper and the deer fell through to a potentially cold water ending reminiscent of the finale of The Titanic. But before the ultimate disaster occurred, the floundering deer was spotted by a passerby even though it didn’t have Christmas lights tangled in its antlers. A rescue mission was put into play. And of course the local news agency sent out a helicopter to video the frigid and potentially fatal nature scene. Then the quick thinking pilot realized he could be the hero if the deer could haul itself out of the hole. The deer obliged and the chopper pilot used the wind from the rotors to send the deer sailing across the ice like a hockey puck after a slap shot. This was one deer story that had a much happier ending than the tale of two bucks who drowned in their version of mortal combat. It was a rescue reminiscent of the dog found 18 miles out to sea stranded on an ice floe. Neatorama found a video of the wind-propelled ice skating deer.